I had such grand plans heading into this weekend but a combination of atrocious weather and a change of heart led me in a completely different direction. I had intended to pay a visit to the Mumbles Pier kittiwakes on Saturday and then head up to the Elan valley on Sunday in search of Pied Flycatchers and Wood Warblers. As it turned out I spent both days (when it wasn't raining that is) renovating our garden patio in anticipation of a barbecue summer. Yes I know I'm probably kidding myself but the result of all that work is that I now have a place to sit outside after work and enjoy all that nature has to offer. I also got to purchase a pressure washer which turned out to be one of the most fun gadgets ever. The only downside was that after scouring the slabs of umpteen years of dirt and grime I looked up to see that most of the dirt was now scattered over the house. The wind this weekend has been the bane of my life let me assure you. But I digress. The reason for mentioning these antics in the first place was to bring me onto the subject of the bird life seen in and around the garden this weekend. As usual there were a good number of raptors about across both days but the three Red Kites that we saw flying around together is one of the best displays we have had. I believe that we also saw part of a courtship ritual between two of the birds as one flipped upside down, almost touching talons with the bird above before they carried on flying around together. It would be fantastic to see some youngsters in the air come the end of the year. A pair of Buzzards and a pair of Ravens were also regular visitors. New life was very much in evidence with the male and female House Sparrow regularly ferrying food back to their nest in my garage roof. We had feared that the nest had failed after the body of one of the chicks appeared at its entrance, but now think that it probably died of natural causes and was simply removed from the nest by its parents to avoid any possibility of infection. Nature can be harsh at times but you can't fault the attentiveness of these particular parents. A less natural phenomenon, and something that we are slowly losing the battle with here, is stray cats. While repairing the garden gate I heard an almighty commotion from the other side so flung it open to have a look, losing a vital screw in the process. The scene that greeted me was rather surreal and over in a matter of seconds. The neighbours cat was running towards me with a newly fledged Blackbird in its mouth while the adults chased and shouted at it for all they were worth. The threat of my foot in its face got the message across rather more clearly at which point the cat dropped the bird and fled. The birds instincts took over then as it headed for the nearest cover and proceeded to lay low. The problem now was that the parents were over the other side of the road and I was torn as to what to do next. Should I leave the fledgling where it was and risk it being taken again by another cat or try to reunite it with its parents? I chose the latter option and picked it up to carry it a way down the lawn to where the parents could see it. The chick immediately ran down the lawn, across the road and into another garden where it again lay low but this time with its parents directly overhead keeping a close if somewhat loud vigil. We also kept an eye on it for a while and all seemed well so hopefully that's one less bird that has fallen victim to our burgeoning stray cat population. Today I was able to reap the fruits of my labour and sit in the garden after work to watch the world go by. My hope is that if I make this a regular thing the birds will get used to my presence and lose some of their inhibitions. Things have already got off to a great start with one of our shyest residents, the Collared Dove, already fairly happy to share the same space as me although he kept a very close watch. The Dunnock, probably our most tame bird, was also very accommodating although it kept to the shade during my stint. The opportunity to just sit and watch from a single location should never be undervalued as you often see behaviours and events that you would otherwise have missed. For instance this evening I saw a Raven fly past with what appeared to be a birds egg in its mouth, as well as watching a Carrion Crow do its best to raid the Jackdaw nest in my neighbours chimney. Fortunately (or not I suppose if you are the Crow), the Jackdaws put up a good fight and soon sent it packing after some fantastic mid-air battles. I also witnessed the arrival of the local Goldfinch population with their fantastic cacophony of calls. Now if only I could get them to use better table manners at the feeders. Do they not realise how expensive Niger seed is these days!? hope that little blackbird is faster and wiser now when it comes to cats! i don't know how bird parents manage with all the nest-building, feeding, waste-removal, then fledging! UGH! too much stress! Looks like your garden is coming along nicely, Adam. Regarding badgers, try emailing the National Trust site at Dinefwr Park (contact details will be on the NT's site) for info on badger-watching. Poor Blackbird, the cats are demons, sorry, but I dislike them. Good pictures. Oh, the Corncrake was on the Isle of Iona, in somebody's garden. I just love that first shot! We have a pair of Goldfinch on the larch (first I've seen here), but they have to date shown no interest whatsoever in my Niger seed feeder. Do you think it is an acquired taste, Adam? An interesting post and very nice pictures! Great post, I personally feel cats should be indoor pets. I feel sorry for the juvie, maybe it will still be OK. Great photos and birds. It's nice that you have place to relax and watch garden birds. My experience is that those shy birds get used to you over time. Fantastic photos! Great post Adam! That was some dramatic backyard action. Here's wishing you a long eventful summer of patio sitting! 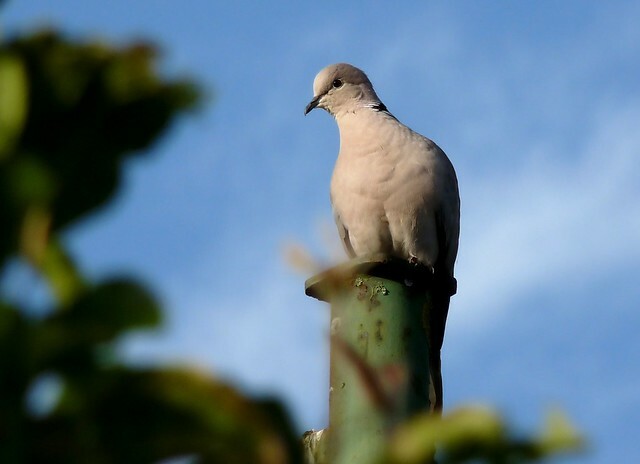 I love Collared Doves, they are so beautiful and elegant! Wonderful capture! Beautiful images and a great post. 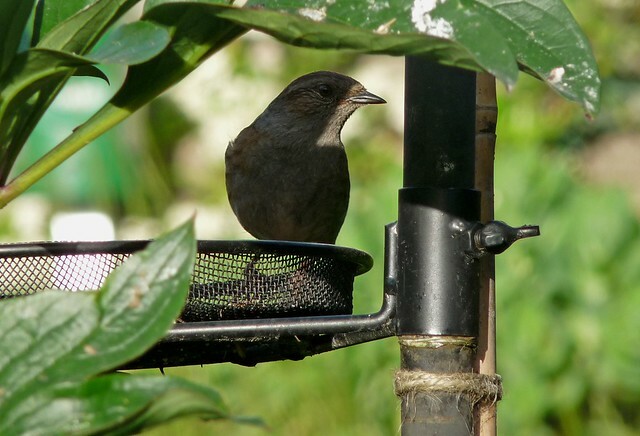 It is really nice to see a post about birding in ones backyard or back garden! Wonderful photos and narrative, Adam! My two cats are strictly indoor cats. I wish that all cat owners would keep their cats indoors, particularly during nesting and fledging seasons, when the cats seem to be drawn like magnets to the young birds. Excellent post Adam. Free roaming cats are the bane of most places on the planet. I always try to send folks to the "Cats Indoors" page of the American Bird Conservancy for information. You are right about sitting in one location and waiting for the birds to come to you. It is a great way to get close to birds and observe their behaviors. Your yard birds will quickly get used to your presence and you will enjoy their company more and more as the years go on.